In an article about another cemetery, local journalist Andy Sturdevant remarked that in his opinion, “The most profound meeting of public space and private lives is in our cemeteries.” And indeed, it turns out that a major inspiration for noted 19th century landscape architect Frederick Law Olmsted’s work in establishing public parks was what he called “the cemetery problem” —his dissatisfaction with cemeteries’ limited capacities to serve as a public space. Before public urban parks became common, cemeteries were all you had. As James Silas Rogers, author of “Northern Orchards: Places Near the Dead,” a book about rambling through cemeteries, put it in a 2014 interview in the Star Tribune: “It seems alien to us now, but in the 19th century, cemeteries were public parks. It was very common for people to go have a picnic Sunday afternoon in a cemetery. There wasn’t the separation between the realm of the living and the realm of the dead the way there is today, and I think that’s a good thing.” But Olmsted would not have agreed totally with this sentiment, because the presence of the dead, or more specifically, of mourners and headstones, restricted a casual visitor’s enjoyment options, physically in the case of headstones, and socially-emotionally in the case of mourners. You could have a quiet picnic there or read a book, but you couldn’t play softball, or have a birthday party. So here is St. Mary’s Cemetery in the very heart of the Field-Regina-Northrop neighborhood. And yes, it has a fence around it, but as James Silas Rogers also said, these fences are important “because it sets them apart as being a special place.” (In fact, as a Catholic cemetery, St. Mary’s is more than special—it’s a sacred place.) But he also likes that those fences aren’t “large stone walls that you can’t see over. The fences always allow one to see into the cemetery and to see out of it, creating a little bit of conversation between the living and the dead.” And also, St. Mary’s has a very nice actual public park right across the street, McRae Park. So maybe Olmsted was right, and without public parks, you do have a “cemetery problem.” But if you have both, and if the cemetery in question has a very neighborly and friendly mission, you no longer have a problem, you have a cemetery asset. That seems to be very much the case with St. Mary’s, which everyone agrees is a major asset to the neighborhood. As far as we can tell, St. Mary’s is one of Minneapolis’ oldest cemeteries; founded in 1873, it is only two years younger than the more well-known Lakewood, and only 20 years younger than Minneapolis’s oldest cemetery, Pioneers and Soldiers. 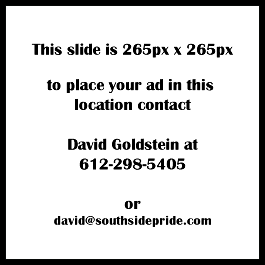 St. Mary’s is the second largest cemetery in Minneapolis, far outstripped by Lakewood Cemetery, at 250 acres compared to St. Mary’s 65 acres. By comparison, Pioneers and Soldiers Cemetery is only 27 acres, and is only a historic cemetery (albeit also very neighborly, with its many cultural activities). By contrast, people, mostly but not exclusively Catholic people, are still being interred in St. Mary’s, which currently holds over 66,000 graves, crypts and cremation repositories. For current burials, St. Mary’s is open to any Catholic, and also to its non-Catholic family members. In the past, several non-Catholics with ties to the community were also interred there. Today, St. Mary’s is managed by a nonprofit organization called Catholic Cemeteries, which manages six other Catholic cemeteries in the Twin Cities. But it was originally a parish cemetery for a church called Church of the Immaculate Conception, now the Basilica of St. Mary. It was the practice in the early years of the city to build cemeteries for urban churches “out in the country” or at least the far suburbs. It’s hard to believe now, but Lakewood and St. Mary’s were not even in the city limits when they were built, and even Pioneers and Soldiers was at the extreme edge of the suburbs. The benefits beyond being an eventual resting place after death that St. Mary’s brings to the neighborhood are many. St. Mary’s is a favored place for sketching and painting and occasionally photography. Two blogs, My Minneapolis at blogspot.com and Wander Along With Me on wordpress.com, feature very interesting and original photographs of St. Mary’s. Another educational/cultural pursuit is that of gravestone rubbings, which are very popular here, especially with students. Like all modern day cemeteries, St. Mary’s can help you (a little) with your genealogy research. It’s all pretty much online though, as the cemetery doesn’t have an onsite staff. Check out the Catholic Cemeteries website for the Genealogy link. Catholic Cemeteries, although not St. Mary’s itself, even has a Facebook page, that is updated every few days with news and photos. St. Mary’s doesn’t have a lot of flashy statuary, although it does have a few outstanding small mausoleums, such as the art deco Lo Pesio family mausoleum fashioned of red and black marble. Another noted memorial is an obelisk style sculpture dating from 1892, honoring Minneapolis volunteer firefighters. St. Mary’s Cemetery has a long-standing relationship with the Catholic fraternal organization, the Knights of Columbus. As a result of this, one of the major official events in its calendar is Memorial Day (this year it’s Monday, May 28) which is celebrated in the cemetery with a Mass at 10 a.m., followed by a parade, honoring of veterans, and refreshments. St. Mary’s has cultural attractions, but its charm is mainly natural, with gently rolling hills stretching from the east side of Chicago Avenue to the west side of 14th Avenue, and from 44th Street East to 46th Street East. It has a pleasing mix of deciduous and evergreen trees, and the metal fencing around it is softened with viney plants that slightly obscure the view without blocking it. For some reason, I think it looks especially nice in the winter snow, a good quality for a northern cemetery to have. And another natural attraction is the fauna. Besides the usual rabbits and squirrels, and an occasional wandering cat or migratory flock of geese, there are also about a dozen wild turkeys that hang out in the cemetery, according to the staff at Family Dental Clinic on the other side of Chicago Avenue. A couple of the huge birds even manage to cross Chicago Avenue to snack at the dental clinic’s bird feeders. 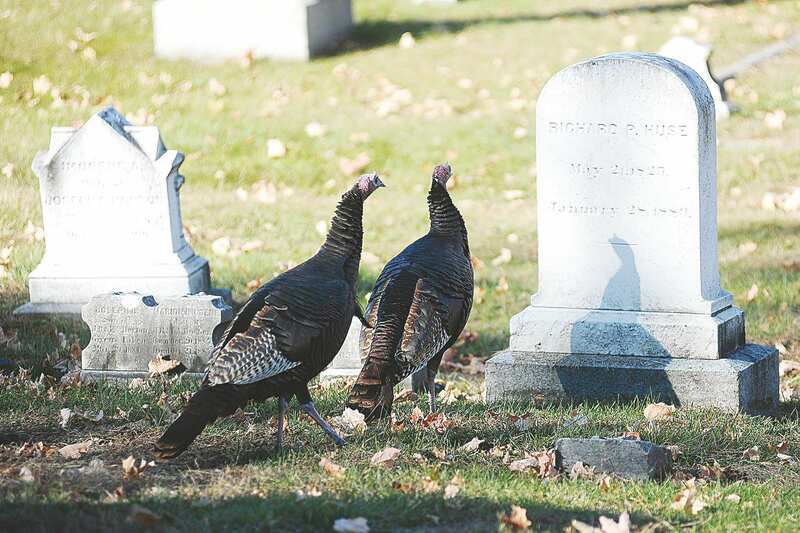 (I think Catholic Cemeteries might plant them there, because on Facebook I found a photo of wild turkeys at Resurrection Cemetery, another of theirs.) And then there are dogs, which are welcomed by the management as long as they are leashed and picked up after. So if this is your dog-walking area, between McRae Park and the 65 acres of St. Mary’s, you and your canine companion(s) need never get bored with the scenery.